At Fabricare, our washing machines provide a superior wash and accommodate much larger loads than traditional residential washers. When you bring your laundry to Fabricare your chore becomes a pleasure, you will finish fast. While you wait you can enjoy a pleasant clean atmosphere, complimentary coffee, popcorn and wi-fi plus lots of reading material to pass the time. There will always be an attendant on hand to help you out, offer advice, or just chat about your day. Join our Wash Club and save on every load you do!! 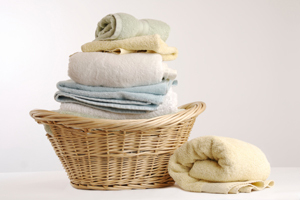 If you’d like to save time, try our convenient Wash/Dry/Fold service. Just bring your laundry and we’ll do the rest. Get your laundry done in four minutes, two minutes to drop it off and two minutes to pick it up! Lot’s of SMILES for FREE! !